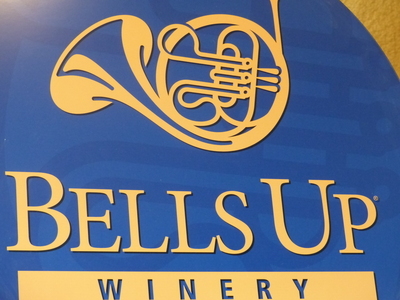 The Bells Up Winery sign is photographed during an oral history interview with Dave and Sara Specter at the winery in Newberg, Oregon on June 19, 2017. The Specters were interviewed by Linfield College Archives staff Stephanie Hofmann. Linfield College Archives, "Dave and Sara Specter Interview 07" (2017). Browse All Willamette Valley Oral History Interview Photos. Image. Submission 394.